Alice is an accomplished and gifted medium with an extraordinary ability to communicate with spirit to provide the answers for the healing that you need. Alice is the medium through which her guides and your guides communicate to give you exactly the clarity that you need at this moment in time. The messages that come through may be from loved one's or they may be messages from guides and angels to give you some direction in your life or even your business. ​If it is a loved one that you need to hear from, Alice can provide the evidence and messages that will release emotion and attachments and allow you to move on with your own life - in fact whatever you need Alice usually has some answers. 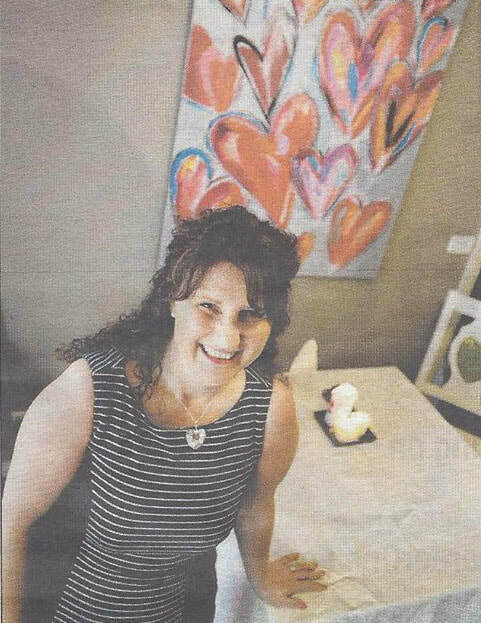 Appointments are usually Monday-Wednesday 9:00 a.m. to 3:00 p.m. and Alice does offer a later appointment each Tuesday at 5:00 or 6:00 p.m.
Each session is an energy exchange of $200 for a full hour, $125 for a half hour and all is recorded and sent to you shortly after your session. There are very limited times available to see Alice in person but FaceBook Messenger Video/Facetime/Skype sessions can be arranged sooner and they work equally as well. She also offers a $50 question which is available here. If you are seeking some clarity or direction in your life, would like to hear from a loved one or you just simply want to be amazed then simply send her a message. what is a personal reading? Energy communication works just as well through the new technologies that are available. So you can be sitting in the privacy and comfort of your own home or even in the office, the park or the car and receive exactly the same experience. All of these technologies are free so all you need is a web cam and if you have an iPad or iPhone it's even simpler with Facebook Messenger Video or FaceTime. The only thing you won't get is a real time hug afterwards. 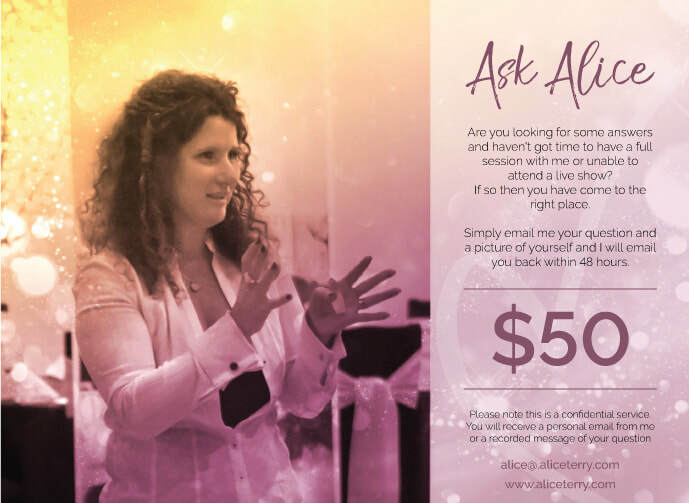 Why not give your friends or family an opportunity to have a great experience with Alice. You could help someone to change their life in some way, someone who may be stuck in their life and doesn't know which way to turn or they are unable to move on following a tragic circumstance with a loved one. Maybe you know someone who needs a little help. ​Alice is a gifted medium with an extraordinary ability to communicate with spirit to provide the answers for the healing that you need. If it is loved one that you need to hear from Alice can provide the evidence and messages that will release emotion and attachments and allow you to move on with your own life. Alice spreads infectious Love wherever she goes, in-demand worldwide for her unique, practical and down-to-earth approach.